38 Taupe Navy Red Hot Dog Iron Pie Iron Double Pie Iron B A A. Comfy Seating For Floor Activities Create impromptu seating anywhere! Multiangle Chair locks into your choice of fve comfortable positions – from fully reclined to upright. Great seating for foor activities like games, reading and watching TV. Specify color from photo. Imported. 33963 Multiangle Chair, 37½"L x 17½"W x 4"H $39.95 B. Sprinkle On A Rainbow Of Color Just a few shakes of our Rainbow Flame Crystals will produce spectacular blue-green fames in any wood fre, indoors or out. Ideal for freplaces, campfres and fre pits; one application lasts up to 30 minutes. Set of two 1 lb. shaker-top containers, each enough for 20-30 applications. Made in USA. 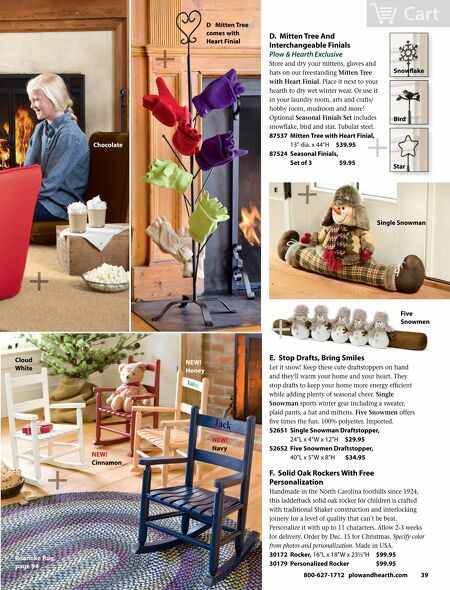 10126 Rainbow Flame, Set of 2 $14.95 Two or more $12.95 each Chair adjusts to multiple positions Popcorn Popper Roasting Forks S'mores Maker C. Fireside Cooking Tools For Hearth, Camping Or Fire Pit Cook tasty treats, from toasted sandwiches, hot dogs and brats to breads, waffes and desserts indoors or over your campfre with our heavy-duty tools with stay-cool wood handles. Chrome-plated Roasting Forks have different colored wood handles so it's easy to identify your own. Approx. 22-29"L. A great gift for family fun! Find more freside cooking ideas and recipes at plowandhearth.com. 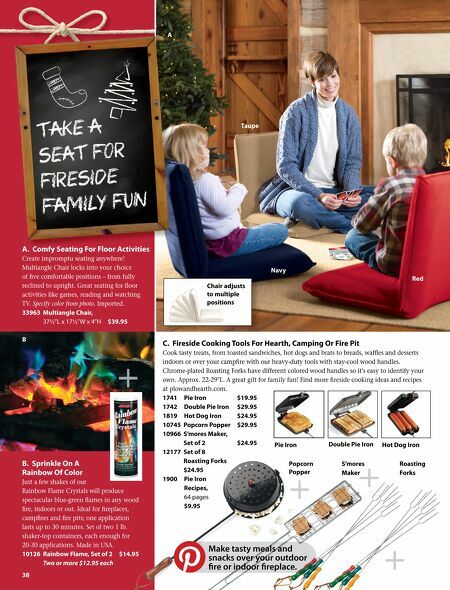 1741 Pie Iron $19.95 1742 Double Pie Iron $29.95 1819 Hot Dog Iron $24.95 10745 Popcorn Popper $29.95 10966 S'mores Maker, Set of 2 $24.95 12177 Set of 8 Roasting Forks $24.95 1900 Pie Iron Recipes, 64 pages $9.95 Comfy S ti Make tasty meals and snacks over your outdoor fi re or indoor fi replace.